1.- Preheat oven to 350 degrees F. Butter a 8×8-inch baking pan, line with parchment paper and butter the parchment paper. Set aside. 2-.To make the crust, in the bowl of a stand mixer fitted with a paddle attachment cream butter for 2 minutes. Add sugar and mix until light and fluffy, 3 to 5 minutes. Add flour and salt , beat until all is well incorporated and it all forms one dough. Put the dough into the prepared pan. Bake for 16 to 18 minutes until just browned around the edges. 3.- To make the filling: In a medium bowl, whisk together eggs and sugar until well combined and slightly thick. Add the flour, lemon juice, and zest and whisk until blended. 4.- Pour the filling over the baked crust. Return to the oven and bake for 18 to 20 minutes, or until lightly browned top and set in the middle. 5.-Allow to cool completely in the pan and put it in the fridge for at least an hour before cutting. 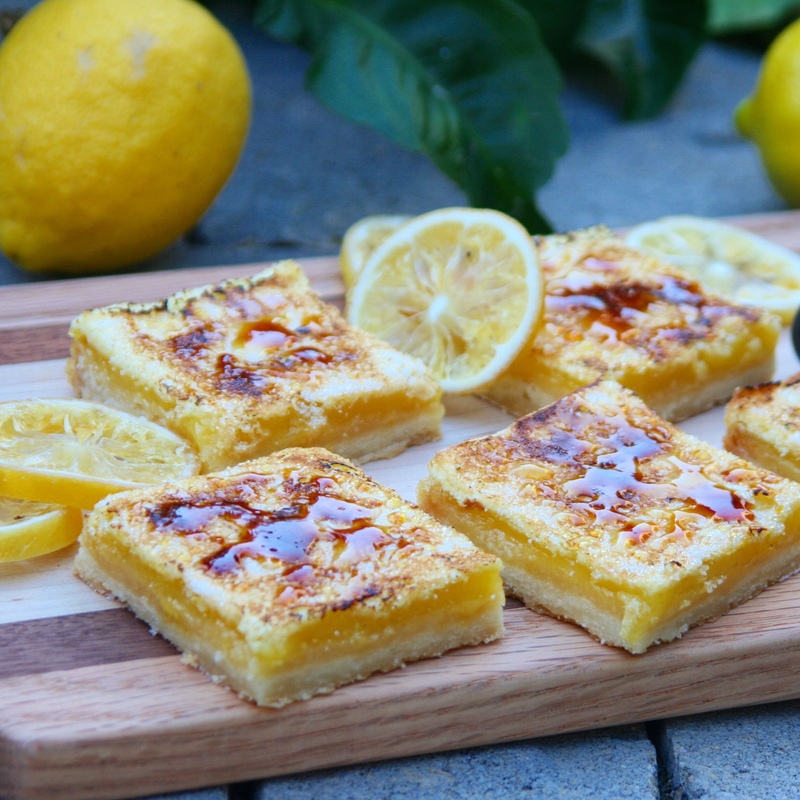 Slice lemon bars into nine squares and remove from the parchment paper. 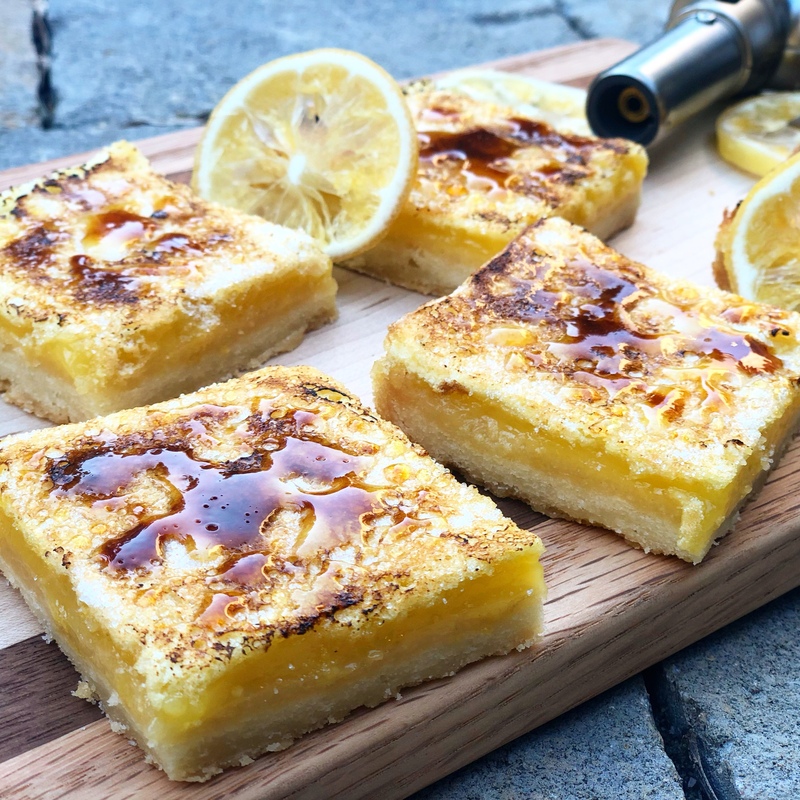 Just before serving, generously sprinkle each lemon bar square with granulated sugar. Use a kitchen torch to caramelize the sugar until golden brown. Allow a few minutes for the sugar to harden a bit before serving.